I believe that’s Sarah on the left and Laura on the right. This entry was posted on Friday, September 7th, 2007 at 1:00 pm	and is filed under Favorite Photos, Fun Things, Memories. You can follow any responses to this entry through the RSS 2.0 feed. Both comments and pings are currently closed. 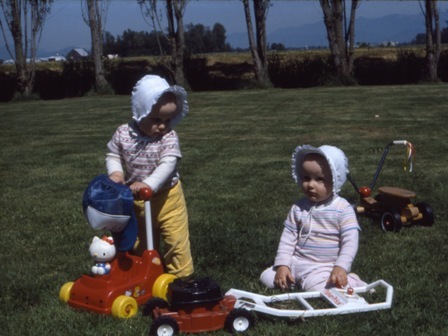 Those little bonnets are so sweet! I’ve been looking at old photos too, lately..
Hmm…I can’t believe how little we are. I feel like I have such clear memories of those times. Hey Sarah’s sitting the way that Deeder does! I thought the baby sitting the way Diederick does was YOU! Look a little closer. What do you think? 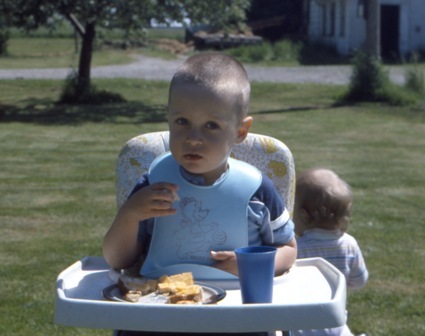 Laura, look at the picture of the baby standing behind the high chair. See the curls? Your hair was more curly in back than Sarah’s hair. The baby who is sitting is that same curly-haired baby. That’s why I think it’s you.